As any computer geek (and let's admit it: you have to be one if you're reading this page in the first place) or anyone living with a geek can testify to, buying a new computer is merely the beginning of a long shopping spree. All computers come with a wealth of optional accessories, and of course the Seven is no exception. Happy shopping! A Seven is fairly resilient in itself (it's designed to withstand a one-metre drop onto a wooden floor), which may explain why it doesn't come with a protective case. Psion markets a slick leather case designed especially for the Seven, but at $ 70 - 80 it doesn't come cheap. Palm-Tec is now marketing a very professional-looking semi-rigid case for the Seven, but which doesn't come much cheaper than Psion's case. The cheapest and easiest solution may well be to look around for a carrying case of the right size, for instance in travel accessories or computer shops. 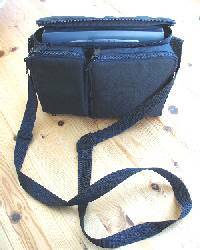 I got my padded shoulder bag at a DIY store. With detachable straps and two pockets large enough for a printer link and travel modem, it does an excellent job at a total cost of about $ 10. Ever since the Series 5 was introduced, Psion has used Compact Flash as a kind of combinded hard- and floppy disk. CF disks come in sizes from 4 Mb to more than 200 Mb. In my opinion a CF disk is an absolutely essential accessory of your Seven, especially as it provides you with a secure backup medium when on the road. Though much cheaper than a few years ago, the disks still don't come cheap. At the time of writing, 128 Mb disks seem to give you the most storage space per dollar. The Psion supports "hot swap" - you can remove a CF disk and insert a new one without switching off the machine. Just remember that all applications installed on a CF disk will be removed from the Program Manager when the disk is removed. CF disks provide you with a handy workaround if you find PsiWin unstable or cumbersome. Simply get a USB or PC-Card CF adapter for your desktop, back up your Psion files to the CF, switch it over to the adapter and transfer the files to the PC. You'll be amazed at the speed! Adapters are surprisingly cheap: I got a TecLogix brand PC Card adapter for about $ 20 in a local, well-stocked photography retailer's. Tthe digital camera boom has done wonders for the CF card business! Considering the extra security an adapter gives you - if your Psion goes down files backed up to your CF will still be available - it is a very small price to pay. Some PC Card adapters (my among them) are also compatible with the Seven. This means that you can insert the adapter with the CF card into your Seven and get a second "hard drive" with drive letter E: . Could come in handy if you want to copy files between two CF disks. The Microdrive is a CF Type II-sized hard disk with a maximum of 1 Gb capacity. Originally produced by IBM, the technology is now licenced to companies such as Iomega (the people behind Zip and Jaz). There are no reported problems with using the Microdrive in the Seven's CF tray, and you get a lot more storage space per dollar than with a CF disk. Furthermore, the Microdrive is not affected by data loss at low power levels. These advantages come at a price: some users report a higher power consumption when using a Microdrive compared with a CF disk (though opinions differ! ), it is slower and makes a low whining noise when active. Read more about how the Microdrive works on the Seven at the Foxpop site. A digital camera is a very convenient companion to your Seven. Not only does the Seven give you a much larger screen on which to admire your work, but you can also email pictures as attachments or upload them to a web site. Most digital cameras use CF disks, and usually you can plug the disk from the camera straight into your Seven. If you want to make sure the camera and your Seven is compatible, try it out in the store before you buy. The Seven's screen only displays 256 colours, which means that JPG images will flicker a bit or look slightly blurry. There is also a lack of photo editing software. Many cameras, among them the excellent Olympus range, use SmartMedia cards. There are PC Card adapters for SmartMedia cards, but not everyone are compatible. Reportedly adapters from Solid State Systems and Delkin Devices does work, while the ones from Simple, Integral, Lexmar and Microtech do not. EPOC applications are small, but when you install enough of them you soon run out of space on drive C (which doubles as an internal disk and computer RAM). A Psion without a roomy CF card is simply not on! But even if you install every new app on your CF, sooner or later you will run into memory problems when running several demanding apps at once. Opera, which is a must-have if you want to surf the web, is a notorious memory hog. Running Opera at the same time as MBMView may result in the dreaded "No free memory" message. If this happens you have two options: you could keep a close eye on the disk gauge at all times, opening and closing apps as you go along, or you could install an extra 16 MB of memory. It is reported that memory upgrades are often sold without a user manual. As a service to users in that particular predicament I created the Dimm installation page. The Seven is mobile-enabled right out of the box - no additional drivers are necessary. In the Modems section of Control Panel you'll find an "Infrared mobile phone", which works fine with common brands such as Nokia and Ericsson. Keep in mind that there are two ways of connection a mobile to your Psion: via a cable or via IR. The cable option is usually cheaper, but the IR connection seems to give users less problems. Based on my personal experience with a Nokia 7110 I can whole-heartedly recommend the IR option. You can use almost any external modem for your Seven, though you will need a nullmodem cable and possibly a gender reverser to connect a typical PC modem to the RS-232 port. Read how it is done at the Foxpop site. There is one strange exception to this rule: according to several users, Psion's own IR Travel Modem (see picture) is not compatible with the Seven. As Psion still lists the modem on its commercial Seven site, it should in principle be supported and you will be entitled to your money back if it doesn't work. The old 14.4 Travel Modem on the other hand works fine. You can also use the PC Card type II slot for a modem (see listing below). PC card modems are a different story altogether. Some work with the Seven's PC Card port, some don't. Below is a list compiled partly from the incomplete compatibility chart at Psion's Enterprise site (it also requires that you register for a free password), and partly based on what Seven and netBook users have experienced. The modems tested by Psion are marked with (P). As for the other modems, I can of course not guarantee that they really are compatible and I urge you to try them out before you buy if possible. The pointer pen on the Seven is ever so slightly different from the one on the 5, so be careful when you buy new ones. The Seven lacks a proper parallell port, which means that you need the printer link to print without going through a PC, unless you should be so lucky as to stumble across a printer that supports IR. The printer link is a cable you plug into the serial port, connected to a battery-powered converter unit. In my experience the link itself works fine with a wide variety of printers. If the printed output looks a mess it is probably caused by Psion's awful printer drivers. An extra battery could come in handy if you're planning to travel far away from a socket. With a total of 16 - 18 hours battery life (8 - 9 hours each), working all the way to Australia suddenly becomes realistic! No computer carrying case should be without the most useful little tool in the world.